DENVER (AP) – Roaring toward the finish, Barack Obama presided Sunday over two Colorado rallies that together drew about 150,000 people, a startling turnout in a key swing state. In Denver, the city where he claimed his historic presidential nomination, Obama stepped on stage and seemed surprised at his own following. He saw an estimated crowd of more than 100,000 people – the largest U.S. rally to date in an Obama campaign full of them. “Goodness gracious,” Obama said as peered at the human mass in Civic Center Park. Smelling victory, supporters even lined the steps of the Capitol, which was so far away from the stage that the people there needed binoculars just to hope to see Obama. The setting, on a sparkling day in this battleground state, said perhaps more than Obama did in his actual speech. It rippled with the kind of enthusiasm found at victory rallies. 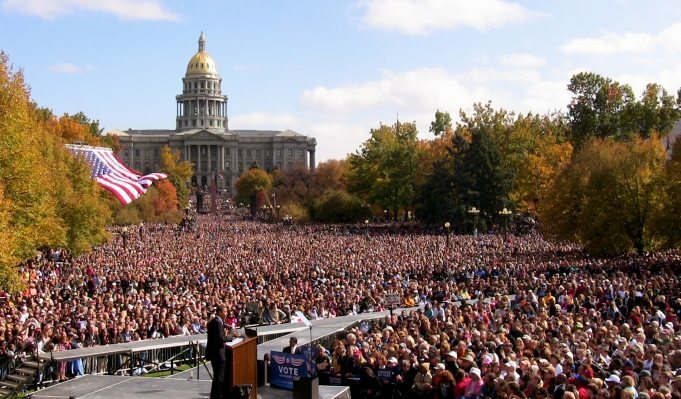 The location of a later rally – a Colorado State University lawn known as “The Oval” – suggested Obama’s possible future workplace. He spoke to an estimated 45,000-50,000 people at the Fort Collins event. Still, wary of complacency or overconfidence, Obama keeps warning supporters that they must work, fight and even struggle for the rest of the campaign. Obama even ended his day in Colorado by calling voters directly. At an unscheduled stop at a campaign office in Brighton, northeast of Denver, Obama sat down and called about a dozen unsuspecting registered voters. He shuffled from one call to the next as thrilled campaign volunteers kept placing calls and handing him cell phones. Based on what reporters could hear from Obama’s end of the conservation, all of the calls went well for him. He then told volunteers to keep working through Election Day. “It’d be terrible if we just kind of let it slip away in that last few days,” he said. Polls put Obama ahead in Colorado with the number of campaign days remaining now down to single digits. Traditionally, Colorado has gone for Republicans in presidential races, including twice for George W. Bush. Obama is trying to snag a win here as part of a multi-route path to capture at least the minimum 270 electoral votes on Nov. 4. Colorado offers nine such votes. In Fort Collins, where trees of golden leaves lined the campus, Obama seemed to revel in what was unfolding. “What a spectacular crowd and a spectacular day,” he said. Obama also jumped on McCain’s comment, made during an interview on NBC’s “Meet the Press,” that he and President Bush share a “common philosophy” of the Republican Party. “I guess that was John McCain finally giving us a little straight talk, owning up to the fact that he and George Bush actually have a whole lot in common,” Obama said in Denver. “Well, here’s the thing,” he added. “We know what the Bush-McCain philosophy looks like. It’s a philosophy that says we should give more and more to millionaires and billionaires and hope that it trickles down.” Obama, though, did not quote McCain fully. The Republican presidential candidate also said: “I’ve stood up against my party, not just President Bush, but others; and I’ve got the scars to prove it.” He also offered specific examples of differing with Bush, from Iraq strategy and deficit spending to campaign finance reform and climate change. McCain also has campaigned aggressively in the state, as has his running mate, Sarah Palin. More broadly, Obama is using his record-breaking fundraising advantage to buy up media time and make what he hopes is a closing argument for the presidency. McCain and his team say the race is hardly over, particularly for a candidate who’s had his share of comebacks. Obama released a new TV ad Sunday that describes McCain as Obama often does on the campaign trail – as “out of ideas, out of touch and running out of time.” It also says McCain is resorting to smears and scare tactics because he doesn’t have a plan to fix the economy. The 30-second ad will begin running Monday on national cable television outlets. Obama ended Sunday at home in Chicago. He campaigns Monday in Ohio and Pennsylvania. All sounds wonderful doesn’t it? The sad part of the story is that they left out the part where the Electoral College just appoints McCain as the new president. Sounds cynical I know, but thinking Obama will be elected by popular vote is just what the Republican machine wants you to assume, when in fact the popular vote means squat. It’s just a way to keep you thinking you live in a democracy. By all means vote, just don’t delude yourself into thinking a vote will matter in the final out come unless of course it’s a true landslide, which is very unlikely given the present conditions of stupidity and racism. I guess the Dems could fight it, unlike the last election when they just gave up, and allowed Bush to be appointed, but bets are that they will cave on it again if pushed to the wall. The GOP machine seems powerful, but look at it – McCain’s campaign floundering, Bush’s popularity at an all time low, Colin Powell has left the bosom of the Republicans – their power has been greatly diminished. Their power to carry out the dark play you describe has been greatly weakened by historic events.